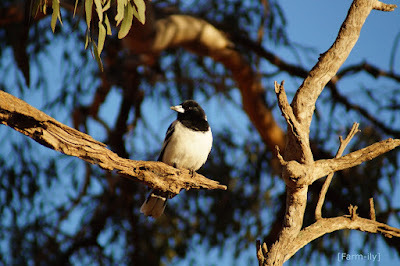 A Pied Butcherbird enjoying the winter sun. Lovely capture...not always easy are birds to rake photos of.. Wonderful capture...hard to believe it is winter anywhere!!! If you could only feel the heat and humidity here. A little bit of heat wouldn't go astray here .... just not that much heat! And a fine fellow he is! Nice shot. What a beauty. Thank you. We love the variety of birdlife that we get on our farm. All are beneficial in some way. Butcherbirds have the most beautiful singing call, but this charming songster rates up there with hawks for its aggressive feeding nature. That's a new one for me. I've heard of the butcher bird but never seen one.